Below is the tweet I sent to Chevrolet SA asking when we can expect the Chevy Volt plug-in hybrid and the Chevy Bolt EV, in South Africa. 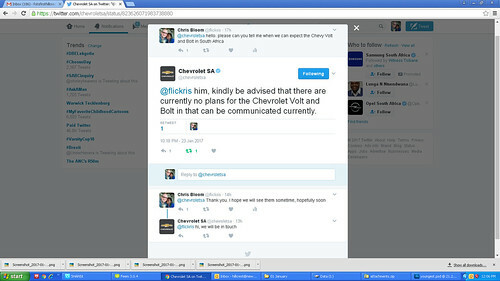 @flickris him, kindly be advised that there are currently no plans for the Chevrolet Volt and Bolt in that can be communicated currently. I think this sounds hopeful that we may see either or both of these cars in South Africa sometime in the future. I'm happy they did finally respond on Twitter after ignoring several queries I made on Facebook. If you're also wanting to see these vehicles in South Africa, please let them know via their web site, their Facebook page or like I did send them a Tweet.